Federal, state, and local governments need to better prepare for natural disasters, Rep. Darrell Issa (R., Calif.) said today at the unveiling of the Government Accountability Office’s High-Risk Series report. The biennial report is designed to highlight specific areas that are at special risk of waste, fraud, and abuse within the government. "Solutions to high-risk problems offer the potential to save billions of dollars, improve service to the public, and strengthen the performance and accountability of the U.S. government," according to a summary of the report. 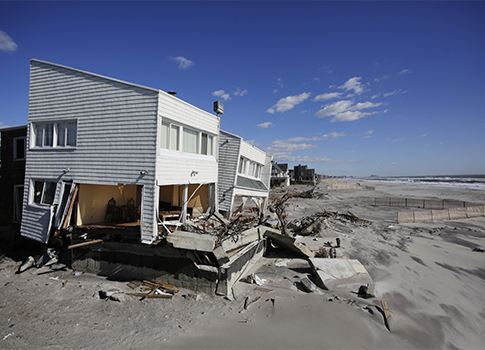 The GAO included the risk posed by climate change for the first time in this report, citing federal emergency aid for natural disasters like Hurricane Sandy as an example of the fiscal liability to which climate change exposes the government. "We can no longer assume that the federal government can come in with an emergency supplemental every time that there’s an occurrence. We have a responsibility to be proactive," Issa said at the press conference. Issa ultimately voted against the Hurricane Sandy emergency relief bill that passed Congress last month. "These events are primarily the responsibility of the cities and states," Issa said. Issa, chairman of the House Oversight and Government Reform Committee, was joined by his committee’s ranking member Elijah Cummings (D., Md. ), the chairman of the Senate Homeland Security and Governmental Affairs Committee, Sen. Tom Carper (D., Del. ), and GAO Comptroller General Gene Dodaro. Issa emphasized that the report does not take a position on the cause of the increasing frequency of natural disasters. He said it simply points out ways that the federal government can better prepare for them and save money as a result. Cummings was far more adamant about the peril posed by climate change. He praised the GAO for including climate change in its report, calling it a "wake-up call for Congress to finally start addressing this issue." Future gaps in weather satellite data also made the high-risk list for the first time, Dodaro said. He highlighted the important role that particular weather satellites played in accurately predicting the path of Hurricane Sandy, and said that the government is at risk of losing this valuable information if there is a gap between when this satellite goes off-line and when the new one becomes operational. "We’re late putting up the next generation of equipment, and that’s a serious concern," Issa said. He noted that Congress thinks in terms of one- and two-year cycles but the acquisition process for these satellites is far longer than that. Also new in the at-risk report is the solvency of the Federal Housing Administration, the conservator of Fannie Mae and Freddie Mac, government corporations that back home mortgages. Dodero also pointed out two areas that have been removed from the high-risk list: the management of interagency contracting and the IRS’s business systems modernization program. Congressional oversight and changes within the agency have allowed these two programs to come off of the list, Dodero said. A spirit of bipartisanship marked the press conference. Carper said congressmen agree on 80 percent of what to do and disagree on only 20 percent. "We’re going to focus on the 80 percent that we agree on," he said. Cummings said congressional oversight could be having a bigger impact than anyone knows. "When I talk to people in the administration, one of their greatest fears is coming before our committee," he said. "Elijah’s right, man, the federal agencies don’t want to have that kind of attention," Carper agreed. He cited the importance of Congress overseeing the "huge colossus of the federal government." Returning to the high-risk list are Medicare and Medicaid, management within the Department of Defense, and the United States Postal Service. The entire report can be found here. This entry was posted in Politics and tagged Climate Change, Congress, Darrell Issa, Elijah Cummings, Federal Bureaucracy, GAO, Hurricane Sandy, Tom Carper. Bookmark the permalink.